Enlargement from the postcard. 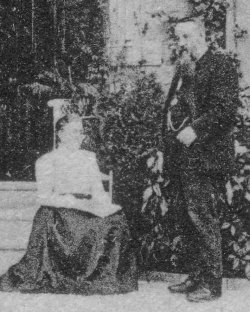 Could this be John and Kate Starkey? Their ages look about right. If the photo was taken in 1905, they would have been about 55. John STARKEY, a schoolmaster and his wife Catherine lived here. They can be followed in the Census for: 1871, 1881, 1891 and 1901. 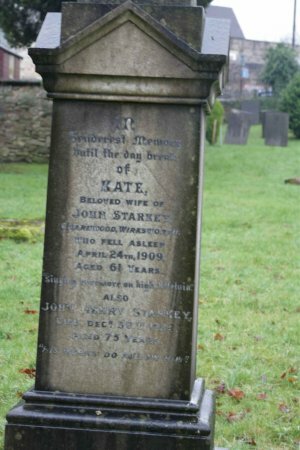 Kate/beloved wife of/John Starkey/Charnwood, Wirksworth/who fell asleep/ April 24th 1909/aged 61 years. Also/John Henry Starkey/died Dec 30th 1924/aged 75 years. The house on the CD you are calling CHARMWOOD is called CHARNWOOD, it is to be found on Cromford Rd going out towards Steeple Grange. The people who used to live there are now buried in the [Baptist] Church on North End, I will send you a jpeg image of the gravestone as soon as I can get one.... be in touch soon as possible. 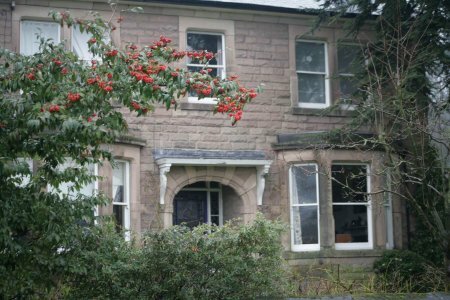 As promised the photo's of Charnwood House & the gravestone of past occupants , the house is on Cromford Rd next to Fern House & they have a shared drive, if you need anything in the future please get in touch. 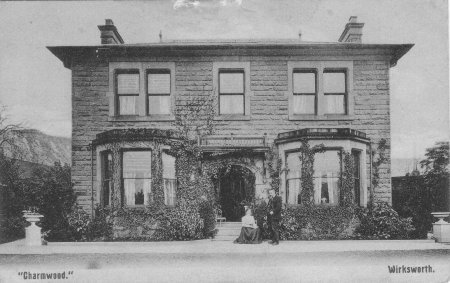 "Charnwood was by the early 1950s the home of the late Dr & Mrs Leslie C. Fletcher, but they moved in the mid-fifties to the Old Manor House in Coldwell St as shown in photo 392. At that time there was not a shared drive between Charnwood and Fern House but a solid wall and hedge, but neither house had a driveway or garage. The present shared arrangement was put in in the mid 60s"
Taken 2006 in the Baptist churchyard in North End, Wirksworth.